Welcome to Pinoy* Online Earning! If you're reading this, then you are probably involved in an internet earning venture yourself. You may not realize however, that there are countless other earning opportunities on the net . I've compiled this list so that other Filipinos like me, as well as all other enterprising individuals, will have a better understanding of the basics of the Get Paid To (GPT) industry and the like. How is this site different from the similar websites you've seen before? Well, first of all, as you will eventually realize, although opportunities abound, we Filipinos cannot partake of them all. A lot of excellent programs are, unfortunately, targeted at our first world counterparts. Fortunately, I have listed all the programs I encountered in which Filipinos, and their fellow Asians, are a welcome addition to the member base. When browsing this site, please take the time to visit the Useful Links for each section found on the left as I found them valuable resources for each type of earning venture. Now that you've had a brief overview, its time to get started. 7.2007 - Pinoy Online Earning now back online! After the drawn-out debacle with my domain name provider Registerfly, a solution has finally been arrived at. Domain renewals may now be done via GoDaddy. 2.10.2007 - I've just signed out for the rapidly growing blog network MyLot. Hopefully, I will have the time and the inspiration to make useful and/of interesting entries. Check it out here. 07.24.2006 - TheMatrixDaily has now completed its transition to a HYIP, and has been transferred accordingly. 04.30.2006 - Received my 3rd payment from MidnightClicking (Total $3.13). There has been a change of ownership from Sebastian to Andrea and the former has proven his integrity by paying out all members with a balance of at least $0.01 prior to the change. 03.26.2006 - Vital EprofitWorks and Auto-Surf-Money update here! 02.25.2006 - Looks like 12DailyPro is taking the fall, and soon. Keep abreast of the current situation by visiting the forums in the useful links found to the left. 02.24.2006 - ZoomInvest was unavailable earlier today due to transfer to a new server. It is currently back up now, and Jimmy has deleted all payment requests to minimize errors. Members are advised to re-submit their requests. Note: some countries may have difficulty accessing the site. 02.23.2006 - Unfortunately, Surf-SWOT Analysis is closing, allegedly due to unexpected payment processor issues. Roxanne, the admin, is claiming that refunds of members based on the date of upgrade will be completed within the next two months. Let us hope this is not just an empty promise. 02.15.2006 - Received my 7th payment from Surf-SWOT Analysis (Total $10.83). 02.13.2006 - EProfitSurf back up, final account alterations being made. 02.12.2006 - Received my 6th payment from Surf-SWOT Analysis (Total $10.59). Received my first payment from No-Min (Total $1.15). 02.08.2006 - Received my 5th payment from Surf-SWOT Analysis (Total $8.30). Members of KingofAutosurf who upgraded via e-gold can have their account balance and details transferred to a new account created in KingofAutosurf.NET. Account transfers can be done here. 01.23.2006 - Received my first payment from 24dailypro (Total $18.06). Be careful though when investing here. 01.08.2006 - 12DailyPro has finalized its decision to scrap E-gold as a payment processor! Bad move since not all members are able to open Stormpay or EMO accounts. 01.01.2006 - HAPPY NEW YEAR! 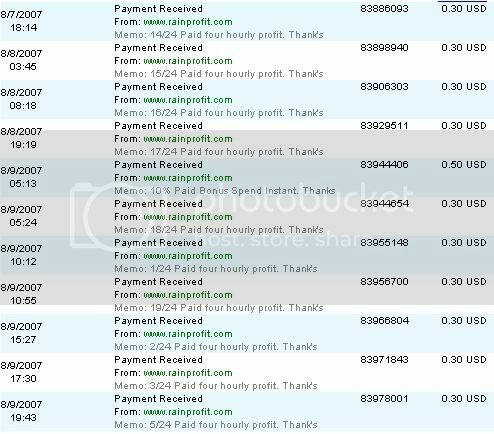 Received my 4th payout from ToClickOrNotToClick (Total $4.00)! Updated the HYIP page to include my list of Gambler's Choices: hit and run HYIP programs that are paying its members at the moment. 12.19.2005 - E-gold back online! Let's hope it stays online and resolves its issues. 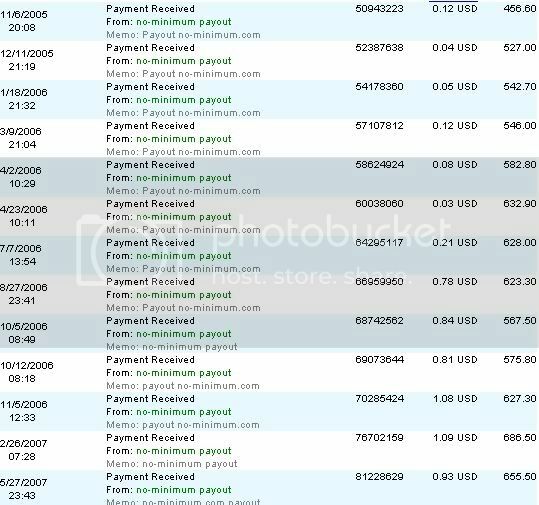 12.16.2005 - Received my 1st payment from WeAllGetPaid ($7.90)! 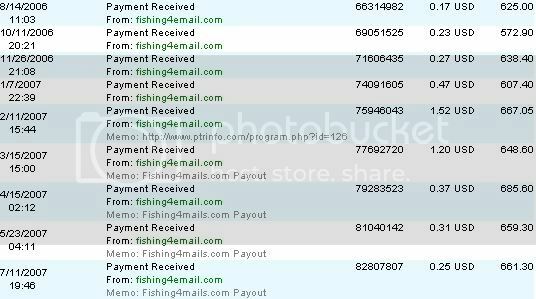 12.11.2005 - Paid again by BestAdSite! 12.10.2005 - Random Payout from Xamis-Mail! 12.04.2005 - Paid my 3rd $1.00 by ToClickOrNotToClick! 12.02.2005 - RainSurf's E-gold Account has been suspended, thus members can only upgrade using StormPay or NetPay. 11.29.2005 - Joined Auto-Surf.biz, where your upgrades last indefinitely! 11.28.2005 - Paid by Cassandra's Clicks! 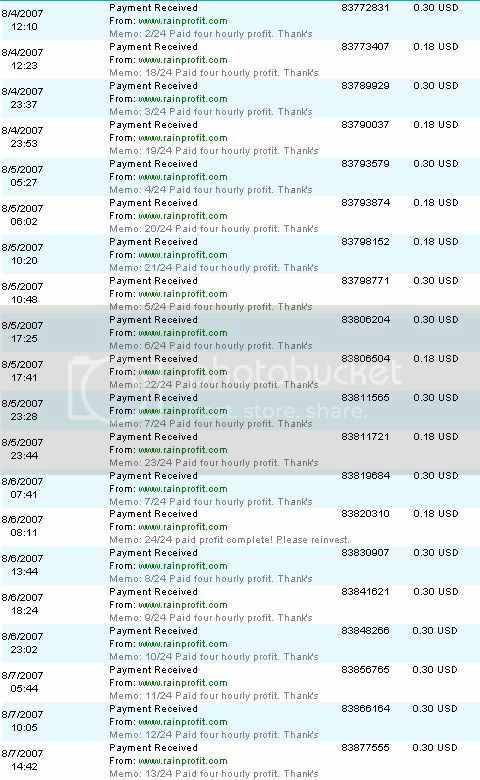 11.27.2005 - Received a random payout of $8 from 5StarPromotions! 11.22.2005 - In a reckless move, I've tried joining RainSurf, which offers 13% daily for 10 days. I've created a new section GPT Watch List, which will feature programs that I've joined but can recommend in good faith. 11.19.2005 - Unfortunately, Estrix Surf is closing. More details can be found here. I will update you if I do get the 40% refund given to upgraded members who are not in profit. 11.13.2005 - Joined ClixSurf, yet another novel program similar to autosurfs. Removed PayDailySurf as it has disappeared without warning. I just broke even at this site. 11.08.2005 - First payment from BGPayMail! After a good run at 4Daily, quit the program to cut down my GPT program list. 10.20.2005 - Autosurf4Euros now under new administration! 09.27.2005 - Added a link to Pinoy Ako Forum, a newly established forum which aims to foster communication between Filipinos worldwide, thanks to Sam B. 09.22.2005 - My account at WolfEmails was deleted, allegedly for ticking Search in the Categories of Interest, which I'm sure I did not. I tried to appeal at the support forum but no reinstatement of account. I plan to redeem my earnings at MailsForUs (same PO) and quit it soon thereafter. Check out my special offers to join as my referral in my favorite GPT programs! Receive e-gold cash back or advertising options! Visit the Linkscout Link Exchange! Disclaimer: This site is created purely for information dissemination. The author in no way guarantees the continued profitability of programs mentioned therein.